Just a couple of photographs today. Peel carrots, then cut into wedges or slice on a bias. Season with olive oil, sea salt and black pepper. Alternately, you can substitute other spices instead of salt and pepper. In the photo above, I used panch phoron, a whole spice mixture that consists of fenugreek seed, nigella seed, cumin seed, black mustard seed and fennel seed in equal parts. Roast at 400 F for 30 minutes or until carrots are tender. Remove from heat and let cool. Meanwhile, in a small bowl, combine 1 tablespoon Dijon mustard, 1 tablespoon brown miso, 2 tablespoons mirin and 3 tablespoons white wine vinegar or rice vinegar. Mix all ingredients together; stir until the miso is dissolved and the sauce achieves a smooth consistency, about 5 minutes. Stir in some minced parsley into the carrots and toss. 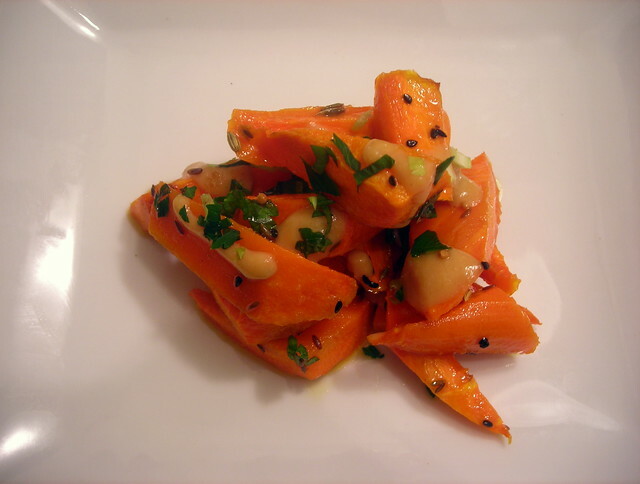 Spoon carrots onto a serving plate; dress with the miso-mustard vinaigrette. Serve at once. Peel cippolini onions; trim off the root end and the stem end. Slice lengthwise and place the onion halves in a Pyrex baking dish, cut side up. In a small bowl, mix together 1/4 cup breadcrumbs, 1 tablespoon chopped fresh thyme, a pinch of sea salt and 3 tablespoons extra-virgin olive oil. Stir until the breadcrumb mixture forms a paste. Top each onion half with a teaspoon or so of the breadcrumb mixture, then drizzle about 2-3 more tablespoons extra-virgin olive oil over the onions. Wrap the baking dish with some aluminum foil and bake, covered, for 20 minutes. After 20 minutes, remove the foil and bake another 15-20 minutes or until the onions are caramelized. Remove from heat, then sprinkle with chopped parsley and serve at once. 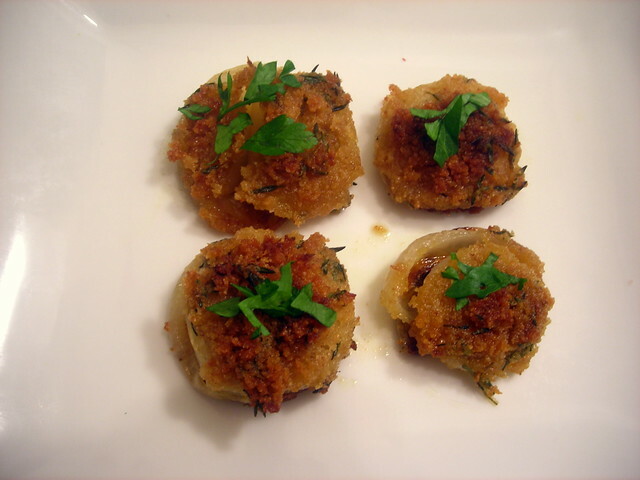 This, paired with a glass of white wine or rosé wine, makes an elegant appetizer. 04 Nov	This entry was published on November 4, 2012 at 8:41 am. It’s filed under autumn, food, food photography, recipe, vegan, vegetarian and tagged appetizers, autumn, carrots, food photography, onion, vegan, vegetarian. Bookmark the permalink. Follow any comments here with the RSS feed for this post. Both od thos are fantastic… and nicely photographed. I like the panch phoron with the carrots! I’d say the panch phoron was a stroke of genius at the time. Thanks for stopping by. The carrots look so adorable! 🙂 fab recipes !